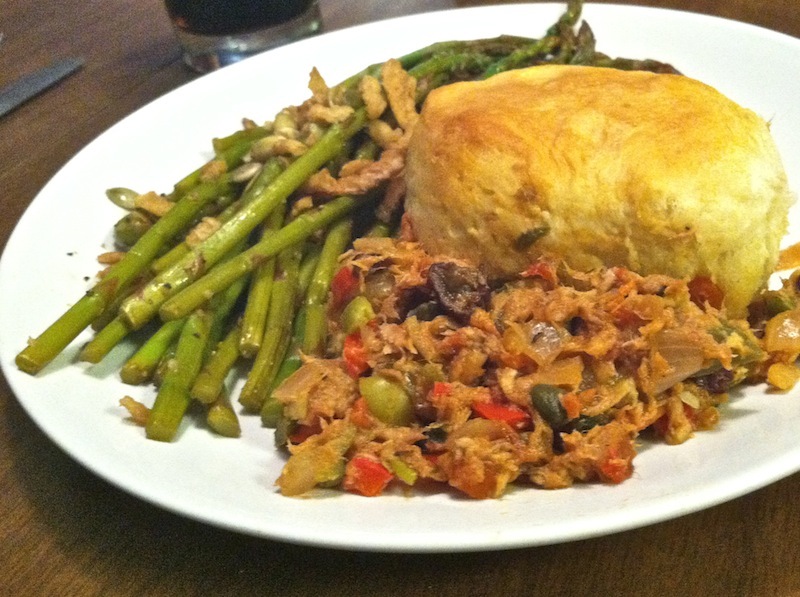 A Fresh Take on Tuna Casserole | Keep It Up, David! A few weekends ago, while flipping through the channels, I settled on a PBS cooking show called “Pati’s Mexican Table,” and for a few minutes I watched host Pati Jinich make a tuna casserole that I wanted to eat right then. It stuck in my head for two weeks. A couple friends came over for dinner the other night, providing me the perfect opportunity to try it out. I modified the recipe somewhat (like I always do, with mixed results), but it still turned out pretty tasty. It starts, like a lot of good recipes do, with onion and garlic. 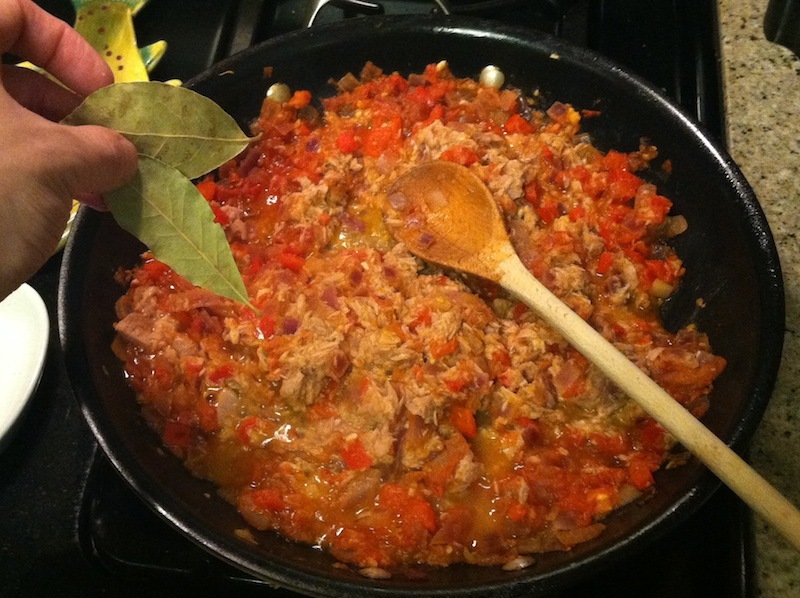 The recipe from “Pati’s Mexican Table” is called Tuna Minilla Casserole. Minilla refers, I think, to an area in Mexico near Veracruz, but I might be completely wrong about that. I am completely certain that Minilla is also the name of Godzilla’s son, but I’ll just tuck that fact away for now, until I need it while playing Trivial Pursuit or when I’m eventually a contestant on “Who Wants To Be A Millionaire” (still on my bucket list). I think one of the reasons why I was so geeked about this recipe is because my mom made tuna noodle casserole regularly when I was growing up, and while I would always eat it (I ate everything, hence a lifetime of major weight issues), it wasn’t a favorite meal. I’ve never craved tuna casserole in my adult life… until I saw this show. 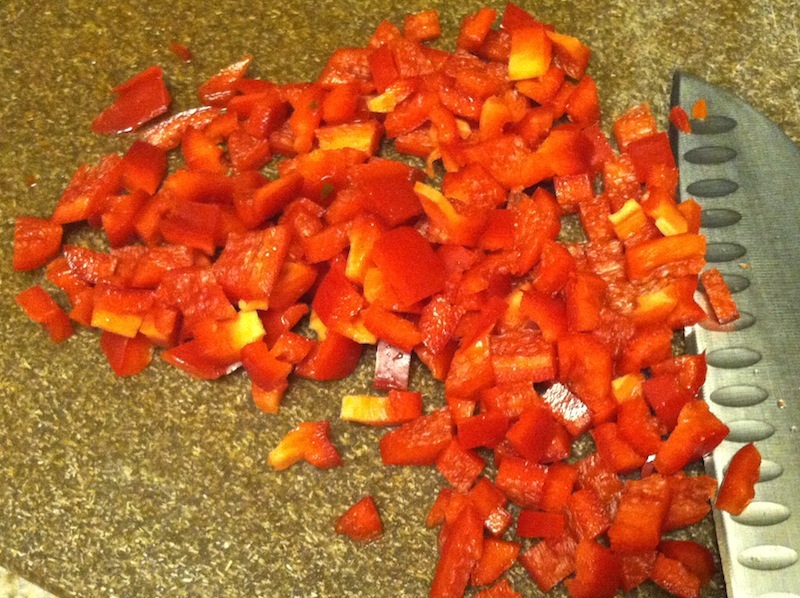 I wanted to use up that pepper, and peppers are common in Mexican cuisine, so I thought why not? I left out the 1/4 cup oil that Pati recommends, and sauteed the onion and pepper over medium heat for 5 minutes with some Pam in my biggest skillet (this skillet will be the only cooking vessel you need). 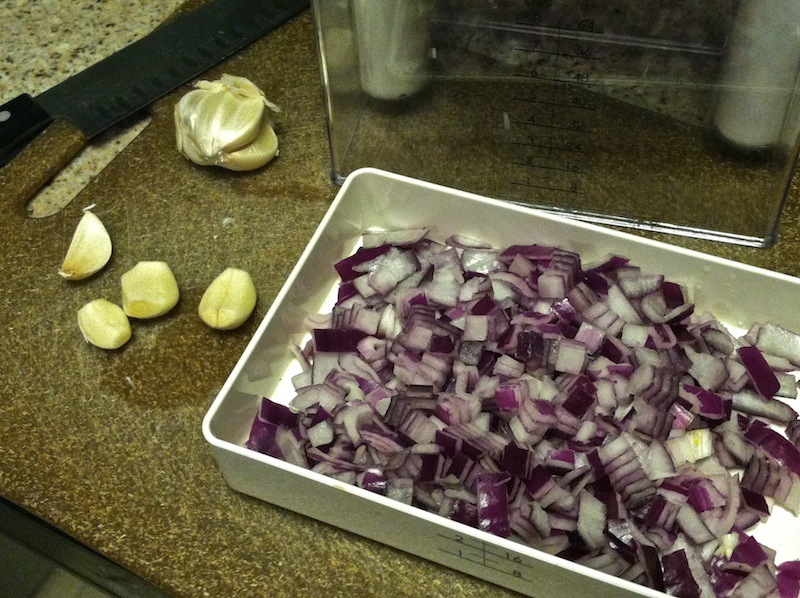 Then I added the garlic, which I ran through my garlic press, and cooked it for another minute. Then it was tomato time! A tablespoon of capers. 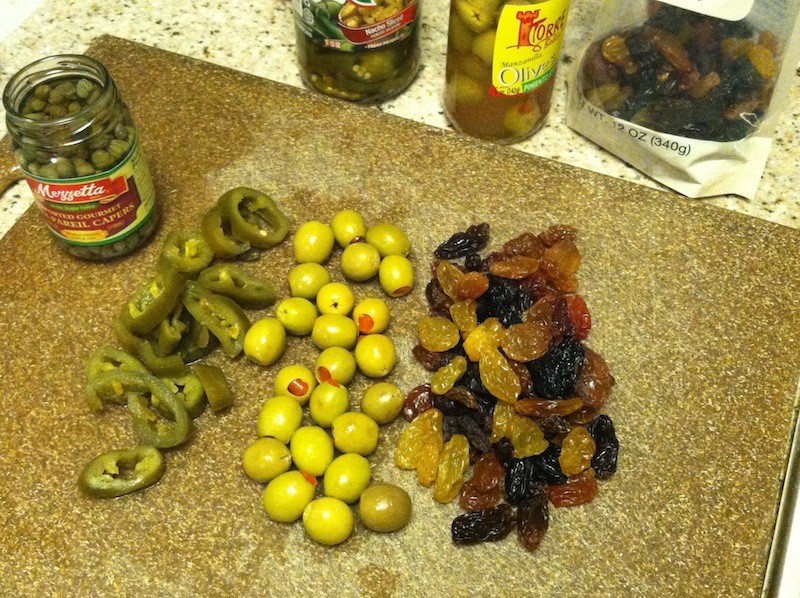 Also, pickled jalapenos (like you kind you get on nachos), green olives stuffed with pimientos, and raisins (I found a variety pack at Fresh & Easy). Pati adds 1/4 cup of those three ingredients, but I was much more generous – maybe half a cup of each, or more. Everything but the capers got a rough chop, and they all ended up in the skillet, along with a few tablespoons of chopped up fresh parsley. 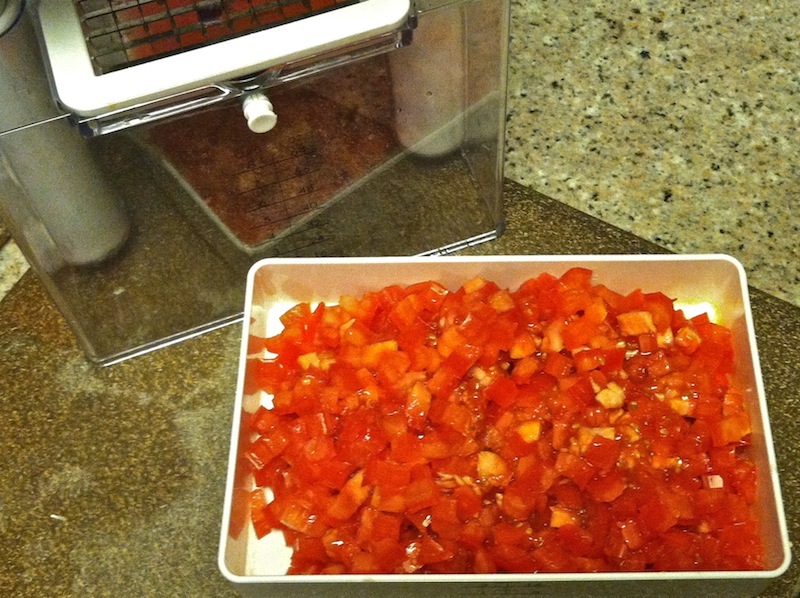 This is when your kitchen starts smelling really good! To turn it into a casserole, Pati covers the entire skillet with a sheet of puff pastry and pops it into the oven. I didn’t want to deal with thawing frozen dough and rolling it out on a floured counter, so I swapped the puff pastry for one of those tube of biscuits in the refrigerated case that pops when you open it. The package has 8 biscuits, and I flattened each one a little bit and spread them out so they nearly covered the entire top of the skillet. Then I put the skillet in a 350-degree oven (don’t forget to preheat your oven! I always forget to mention that at the beginning) for 16 or 17 minutes, until the biscuits are cooked and golden brown. Everything else is already cooked, so all you’re waiting on is the biscuits. The casserole was delicious. Complex, rich flavors, lots of fish but not fishy-tasting, and deeply satisfying. You can learn from my mistakes. Don’t use the biscuit dough. The biscuits rise too much and it’s altogether too much bread. My intention was to peel the biscuit dough in layers so I could thin it out, but that proved too difficult. Next time, I’d use crescent dough, because that’s super thin (provided you don’t roll them up into the crescents). OR, I’d skip the dough completely, and serve the dish as more of a hash, over rice or quinoa or another grain. That sounds great! 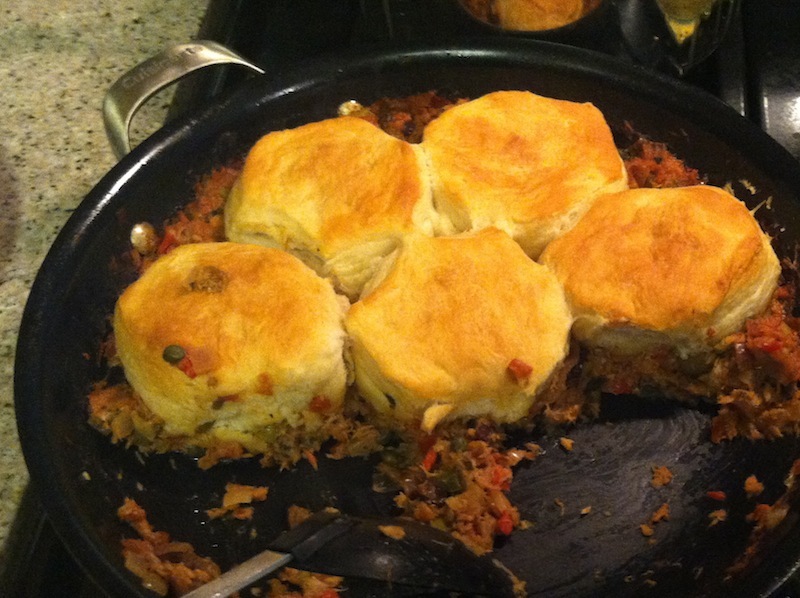 Biscuit aside, I’d make this again in a heartbeat. And you should try it too! It’s one-pot, not too labor intensive (excluding lots of chopping), and trust me: it makes great leftovers. Best of all, it’s healthy: basically tuna and veggies, with no added oil or butter (the biscuits add a lot of calories – another reason to leave them off, or avoid going for seconds or thirds). This entry was posted on Tuesday, February 11th, 2014 at 12:13 am and is filed under Uncategorized. You can follow any responses to this entry through the RSS 2.0 feed. You can leave a response, or trackback from your own site. For the last couple of months, I decided to try adding fish into my diet. I’ve always hated fish since I can remember. Now I love sushi! Who knew? I’ll give this recipe a try. 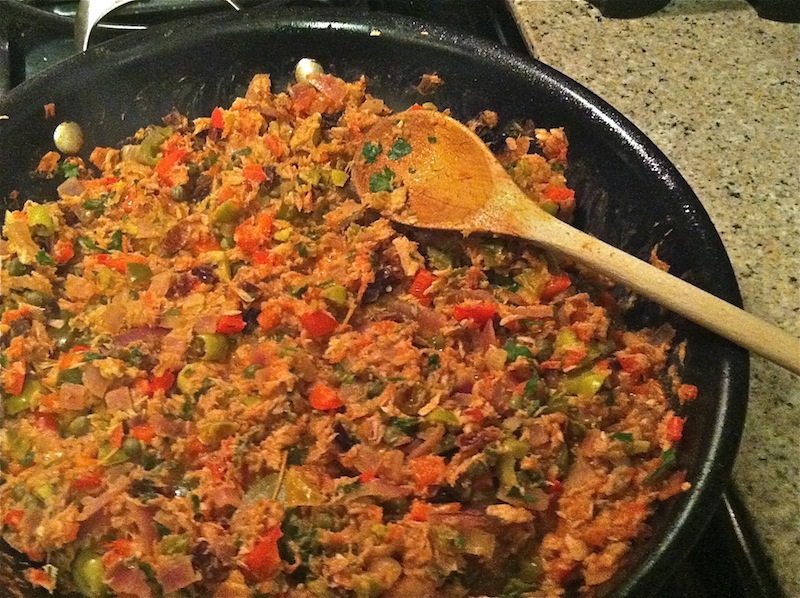 Tuna fish always tasted too fishy for me but perhaps a casserole can do the trick. But I’ll skip the biscuit and try red quinoa. Let me know what you think! Glad to hear you’ve embraced fish. I love it. This filling is really good as a taco too. I put some finely shredded cabbage and avocado crema on top, Umm- be sure to use two tortillas per taco.